The Eucalyptus has a long history and has many uses in industry. It is widely used in medicine as well as in many beauty products. Its fragrance makes it a popular scent for perfume or incense sticks. The plant is a flowering tree that has very fragrantly scented leaves. Several species of shrubs are also included in the myrtle family. There are over 700 species that are native to places world wide. Areas that commonly sell eucalyptus include Fremont, CA, Newton, MA, McKinney, TX, Anaheim, CA, and Sioux Falls, SD. These areas mainly provide floral arrangement deliveries, but have been known to grow for its other uses as well. E. albens, often called White Box is common in New South Wales. It has pale green bark and the leaves are round and pale when young. It can grow quite tall and is found in other places in Australia. E. badjensis is another native Australian species within this family. Found only in wet forest, it is a protected species and quite rare. It is locally known as the Big Badga Gum due to the area it grows in. E. globulus is the most commonly found species in the entire family. It is heavily cultivated in Australia and can be found elsewhere. Non-native variants have been found in the United States and Europe. Often called Blue Gum, it has been widely planted in many locations. It can grow rapidly when given the right conditions and adapts well. It can also grow well in the tropics in higher altitude conditions. It is possible to grow Eucalyptus in a garden depending on climate. It is better suited for areas where temperatures stay above 20F. Any colder and the plant may be subject to freezing and can die. A hardy version should be chosen by those in colder or cool climates. Some species may not grow as rapidly, making them ideal for gardens. However, many of the species can quickly grow too tall for lawns. One important consideration is that these trees need a lot of space. Some may grow up to ten feet during every growing season, up to 300. There are many regions where this height is not a viable option. A sunny and warm location is best for both seedlings and trees. Each variety may have its own requirements for water and sunlight. This should be checked prior to planning to add them to landscape. The fragrance is popular for uses around the home and in medicine. The essential oil is often extracted and sold in small bottles. It is then used to encourage healing or scent the home while sick. The oil is also a popular additive to bath products such as salts. The calming smell makes it ideal for those who may have a cold. It can also be used as an incense for everyday home fragrances. The dried leaves are most often used for dried floral arrangements. Though dried, they remain fragrant for some time, often months. They may be used in a wreath or as part of a dried flower bouquet. Some may choose to take another route and grow them in containers. Bonsai versions are immensely popular offerings for many florists. While they can grow quickly, the bonsai technique keeps them small. There are many unique ways to shape these miniature Australian trees. Some may include tiny pebbles or sand as part of the decoration. 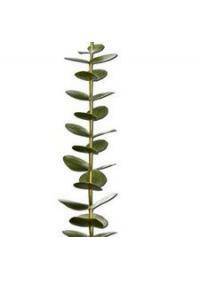 Some florists may also add small decorations to the eucalyptus trees.